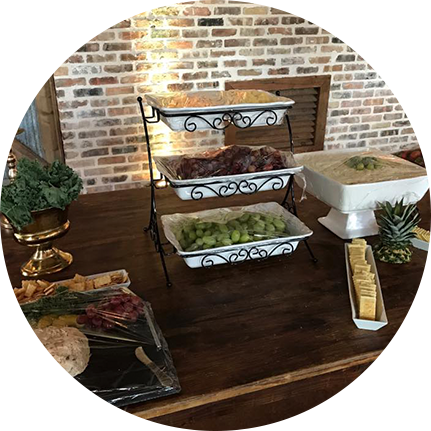 Ms. Ann's Catering – Where food is a blessing to your soul. Where food is a blessing to your soul. We used Ms. Ann’s catering for my sisters wedding. They were absolutely the best. The food was delicious and she always stayed in touch to makes sure she was always up to date with our changes. They are wonderful people and they make you feel like family. I highly recommend them to anyone looking for wedding catering for their big day! Their food will warm your soul. Great food and wonderful staff! I recommend to anyone! The chicken and the Finger foods are delicious! One of my favorite items on Ms. Ann’s catering menu is the delicious punch she makes. Literally made my taste buds explode. My family is coming out of town (from the north) and I’m ordering food from Ms. Ann’s so they can get that taste of southern cuisine! I Definitely enjoy her food and recommend to anyone for ANY EVENT! Her family is SO NICEEE! awesome service! I had THE best experience with Ms Ann’s Catering. They helped make my wedding day everything I could’ve dreamed of and more! From the beginning, the team laid out an entire spread for us to come in & taste food to be sure that everything would be exactly what we wanted....on our wedding day, not only was the food absolutely delicious, but the presentation of it all was beautiful. The entire team showed outstanding professionalism, and we are just so grateful to have had them on our special day! Thank you all!!! I am a huge advocate for supporting black owned businesses, and this business did not disappoint! From the first phone conversation I had with the owner to the day I walked into my event was nothing short of a pleasant experience. She brought my vision to life! I sent her pictures of what I wanted and she executed each and everyone of my ideas beautifully! Not to mention I was in another state and didn't get to see my venue until the day of. There were absolutely no hiccups. I walked in and nothing had to be changed or corrected. I will definitely be using their services again! Excellent!! Just finished for lunch and it was top notch! Had the catfish plate and can't beat it, the food or price. And its quality catfish, not the generic catfish most places are serving. Generous portions and very friendly people/great service. Looking forward to trying out the rest of the menu. I don't know where to begin...Mrs. Kathy (owner of Ann's Catering) was nothing short of amazing! I literally hired her two weeks before my wedding and she delivered catering services plus more. I was a bride in complete distress after planning a wedding for 150 guests. Mrs. Kathy assured me that everything is going to be fine just let her lead the way. I had a few issues with set up and break down...ladies if you're planning your wedding do not forget you have to have someone set everything up and break it all down at the end. I totally forgot about this step and Mrs. Kathy referred me to someone who can set up my reception and she took the responsibility of breaking down the reception. Thank you Mrs. Kathy for handling the situation when you didn't have to! Now on to the food..y'all the food! There aren't enough words to describe how delicious it was. I'm very hard to please and super picky about what I eat. My fiancé and I chose chicken because hey everybody loves chicken! We served baked lemon pepper chicken and fried chicken. Y'all everybody was coming up to me at the reception telling me how great the food was. I didn't even get a chance to eat at the reception but when it all ended Mrs. Kathy and her team, had ALL the leftovers packaged nicely for us to take home. I ate the next day and loved every bit of it! The lemon pepper chicken was sooooo flavorful, it was like a rotisserie chicken flavor but 100 times better. The sides were awesome as well... string beans and loaded mashed potatoes. The fried chicken was to to die for it was HUGEEE, juicy, seasoned and guess what Popeyes doesn't have anything on Mrs. Kathy! Mrs. Kathy and her team didn't fail me not one time and I can't thank you enough! Everyone was dressed very professional and they all worked as a team. Thank you all!! I tried it for the first time & really enjoyed it . I highly recommend trying Ms. Ann's Catering ! I recently used them for my graduation dinner and everything was AMAZING!!!! Absolutely loved the food. Ms. Ann Catering is by far the BEST catering service I've ever used. They catered my daughter's 13th birthday party. The food was phenomenal. Mrs. Sanders and her staff were very professional and far exceeded my expectations. My husband and I were very pleased. I would recommend them to anyone. 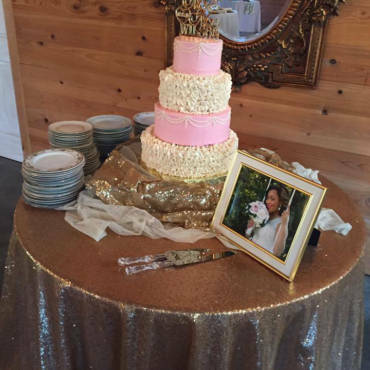 No matter what event you're planning, Ms. Ann Catering can meet your needs. Definitely book them. You will not be disappointed!! Her food is soooo good. I would let her cater any event that I may have. She's professional, and she will give you exactly what you ask for. I'm looking forward to working with her again in the near future.. The Best! Always has great food and everyone is super nice! When I hear of an event that has Ms. Ann's Catering, I am on time and I sit at the table that will most likely go first in line!! The best food no matter the menu and the staff is so sweet! Ms. Ann's Catering is awesome! The service is fantastic!! I will be using her services in the near future. Enjoyed the food and the staff was very professional! The food presentation, the taste of the food and the staff were all excellent! I will definitely refer anyone who needs a caterer to Ann's Catering. They were very nice and professional; they even provided "carry out" plates as a service at the event I attended. I tried it for the first time today and I was really impressed... The chicken salad, wings, hamburger . Overall I was very satisfied with the whole services. 2up. We love Ms. Ann's Catering and More! The food, service and presentation ALWAYS exceeds our expectations! They've been our caterer of choice since 2013!! All of our special events are a success because of them!! Ms. Ann’s Catering is a catering service inspired and named after a dear loved one, Nancy Ann Sanders. We specialize in creating the perfect menu for your joyous occassion and we also specialize in decorating. 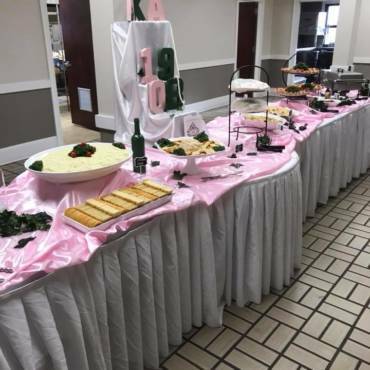 We have catered for many different events/occassions such as birthday parties both child and adult, weddings, baby showers, church programs, and many more events. Our favorite and most requested product is our fruit table which will be created specially for your size of choice. If you would like to sample some of our food? Stay updated with our Facebook to see when and where we will be cooking next. Please visit our contact page, if you have any questions.